My husband and I came back from Toronto recently, which is where we met ten years ago. It was a great trip, and we got lucky with beautiful fall weather - no rain! In December, we will be celebrating our ten year wedding anniversary! Do you ever feel like when you are on vacation you forget to eat healthy? 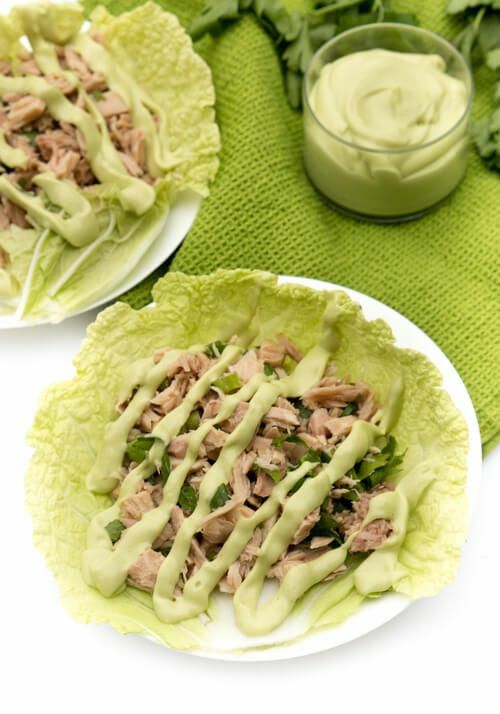 That usually happens to me, and when I come home, the only thing I want to eat is veggies, and this is how this tuna salad recipe was born: I needed something quick, light and healthy to get me back on track and energized for my daily life. I loved this avocado dressing, at first wasn't sure where to add the avocado, but on my third attempt this was the best way. Avocado dressing is creamy and has a slightly sweet taste to it. Tuna has some good benefits. It provides your body with essential omega-3 fatty acids, selenium (vital for metabolism and thyroid function), and proteins. Avocado, a very nutritious fruit, provide you with your daily serving of vitamin K and potassium while green onions fill you up with fiber and folic acid. Place tuna with water into a bowl. Mix with chopped green onion and 1 tablespoon fresh parsley and 1/2 teaspoon salt. (Makes four cups). Divide tuna mix between 4 Napa cabbage leaves. Avocado dressing: In a blender, combine the avocado oil, honey, avocado, garlic, juice from lemon, orange juice, and a pinch of salt. Puree until smooth. Makes one cup. Drizzle avocado dressing on salad.